There are two types of fly boxes, both ripple and slit foam that come in a medium and large size. I use two sizes, the smaller size for assorted nymphs and wet flies and the lager size for streamers, leeches and seal buggers. The newer box, although it costs a little more has a clear see-through lid that allows you to see what is stored inside. For the price, compared to other fly boxes, can't be beat. Ed Wachter nets are of the best quality available today. I prefer a wide hoop and deep well for trophy sized trout. These are oak crafted and superb craftsmanship. Think of what an advantage it is to watch how a trout reacts to your presentation. If you spook him, your are not going to catch him. 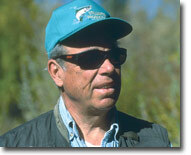 Polarized sun glasses provide a huge advantage for the angler to spot trout below the surface by removing the glare. They also help to determine lake depths or underwater vegetation. If you want to be good at stillwater fly fishing, you need a quality pair of polarized sun glasses. No, not those that cost $100-150 dollars, you can buy quality for much less. The Normark Company offers an excellent pair of glasses for only $19.95. These are sun glasses that are light weight, provide quality eye protection from ultra-violet rays and are well constructed at an affordable price. This is the ultimate accessory for all those gadgets you need when fly fishing. No more need for the neckless that is dangerous and prone to injury This product has a steel cable (small) and enough clip rings to attach everything you need. Just clip it on to your vest or jacket. Understanding the zones of depths trout feed or hold in is absolutely critical to the success of any stillwater fly fisherman. However, knowing how to apply the correct line, pattern and retrieve is the difference between catching a few trout and lots of trout. To help remove some of the mystery, I have designed a simple four card system that fits into your vest pocket to answer those difficult questions when you need them answered. No more trial and error approach as to line, fly or retrieve choices. This will make it simple, easy to understand and easy to apply and you don’t have to leave the water. This is what stillwater presentation is all about. and extra batteries that cures the application in seconds. No more half hour waits. It stretches and it’s permanent. This is a tool used to tie a wide variety of fly fishermen's knots. Fast and easy to use, you will find this tool is a necessity when on the water. An all in one tool to use as a line clipper, eye cleaner, hook sharpener and for tying nail knots. With this, you don't need a variety of tools, just this one. You can't fly fish without having a pair of nippers at your disp[osal. With this pair from Tie Fast Tools, it's sharp, has an eye cleaner point and can be easily attached to your fly vest or jacket. 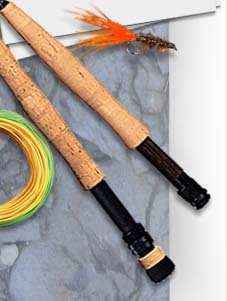 This tool is used to remove the fly from the fish's mouth or for crimping down the barb of your fly. It's quality engineered for long lasting use.